OK, so maybe I'm not in a huge "Celebrate Life" mood at this particular moment, what with Emma being sick for the fourth day in a row and me missing a Superbowl party because of it. But hey - at least being shackled to my house with a sick kid and an absent husband (he promises to only have a marginal blast at the party) means that I can get my latest class uploaded to my blog and website. Emma was gearing up for a sick day all week. She would complain of a headache in the morning, glance wistfully outside and wish for a snow day, casually suggest staying home and then quickly rescind when I mentioned that a sick day meant no TV, no choir, no Girl Scouts, no swim lessons and extra homework when she went back. But by Thursday she really did seem a little under the weather, so when she asked to stay home, I let her. During the morning hours I really thought she was faking. She had set herself up nicely in the guest room with the TV remote and a bunch of pillows and seemed cheerful and, dare I say, healthy! I mentioned that a sick day meant no TV, since rest was so important. She reluctantly handed over the remote. By lunch time, though, she was officially sick - fever, chills, coughing and a whole lot of throwing up. (Bleh) I quickly gave her back the remote! I am not describing a sound here. Emma actually said the word "Moan" while laying in the bathtub, one arm draped dramatically across her forehead. I *do* feel bad for her, but she is her father's daughter, inheriting the "lousy patient" gene in full force. Luckily she only had one day of throwing up, but the coughing and fever remains, so if she's not better by tomorrow she'll have to go to the doctor. This is a project that I designed specifically for an event in The Netherlands. 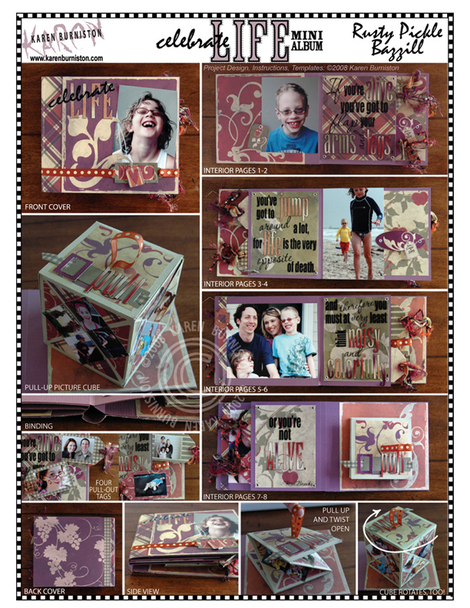 Akkefietje is hosting a "Celebrate Life" scrapbooking weekend and requested that I design a class for it. I am not attending, so someone else will teach the class. 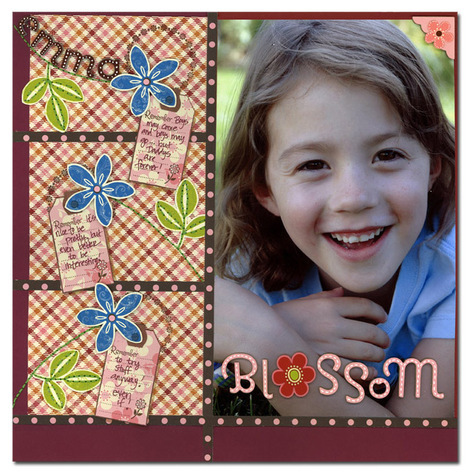 However, I will be teaching Celebrate Life in Colorado on March 8th at Scrapbook Destination. Now the inspiration for the cube came from a recent episode of Myth Busters where they wanted to bust the myth that a lead balloon can't float. They had to use extremely thin and fragile lead foil to construct the balloon, so they came up with a twist cube concept for building it flat and then adding helium to expand it into a cube. I grabbed some paper towels and built a prototype while watching the show. Unfortunately, the twist cube, as shown in Myth Busters, really only worked with lead foil and paper towels, neither of which were on my desired supply list. Cardstock was too rigid to overcome the inherent lack of precision in templated projects and, as a result, the first 9 prototypes failed. They were either too hard to expand, too hard to collapse, or they ripped out on a seam. It took some screaming, some tearing out of hair, some stomping on non-working cubes, but I finally figured out how to re-engineer the cube with an open seam and a rubber band, and the 10th prototype worked! This class may eventually be offered as Home Construction, but not yet. I want to teach it for a while first, so if you'd like me to come teach this class in your store, please contact me. Speaking of Home Construction - thank you! The orders have been pouring in for Love Story and I can hardly wait to see your creations. Definitely send some photos if you can! And now, I must get off this computer and play a game of Spy Web with Emma. After I fetch her a tissue, that is.